How do I report paired samples T-test data in APA style? Home > How do I report paired samples T-test data in APA style? 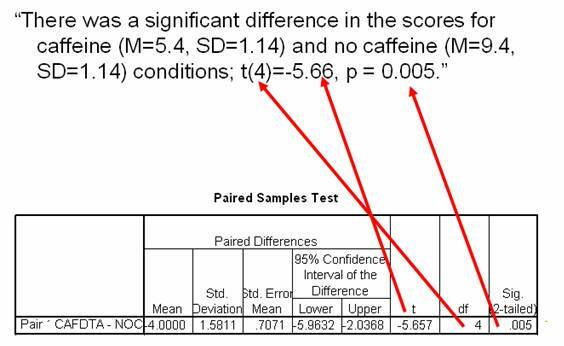 You will want to include three main things about the Paired Samples T-Test when communicating results to others. If we were reporting data for our example, we might write a sentence like this. You want to tell your reader whether or not there was a significant difference between condition means. You can report data from your own experiments by using the template below. Let’s start by filing in the Mean and Standard Deviation for each condition. Now we’ll finish up by filling in the values related to the paired T-Test. Here we enter the degrees of freedom (df), the t-value (t), and the Sig. (2-tailed) value (often referred to as the p value). Since it might be hard for someone to figure out what that sentence means or how it relates to your experiment, you want to briefly recap in words that people can understand. Try to imagine trying to explain your results to someone who is not familiar with science. In one sentence, explain your results in easy to understand language. You could have also written the following sentence. Both sentences are so much easier to understand than the scientific one will all of the numbers in it.